Ralph sent me this. 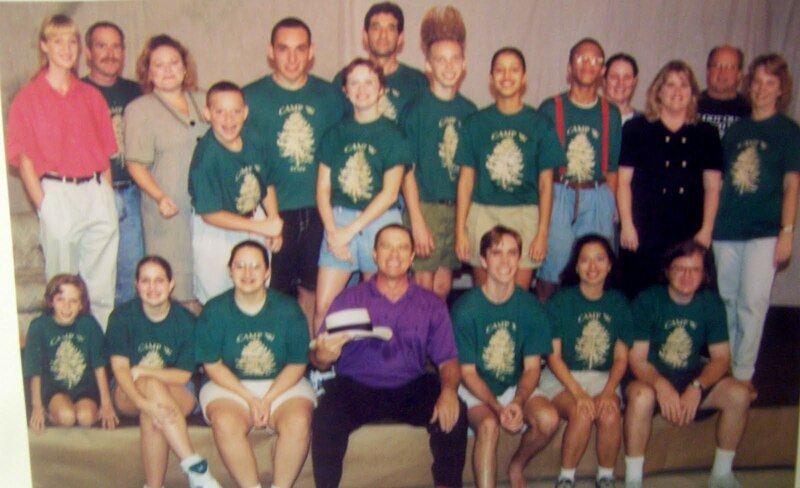 It's the Camp W cast, summer of 1997. Front row, seated, left to right, Elary, Kim, Christina, Ralph, Macon, Helyn, and Carl. Standing, left to right, Kim, Rick, Laurie, Daniel, Carlos, Hillary, Gonzalo, no idea who the kid with the hair is, Cecilia, Richard, Gail, Mary, Don, and, last but not least, NANCY! That's Richard Cleasby with the hair. That was the summer we went to California with our Girl Scouts. Mary and I went to the dress rehearsal for the play but missed the actual performances because we were on our trip. Funny! Helyn confirmed that was her. By the way, that was Chris Cleasby, not Richard. Richard was the dad.